--Can I do this to the one I am using? Or does this have to be done to a clean install? I think I'd like to try this and have separate saves too. Feel free to follow the same steps on your copy of Puppy Linux. 1. Copy the files mentioned in my post to your USB SanDisk stick. The MSG files have the bootup tips. I find it frustrating when they're not handy at start time. 2. Compare the contents of the CD's syslinux.cfg file and the copy on your SanDisk stick. The only real difference should be the pmedia should equal usbflash. 3. I recommend leaving a copy of any file you change on the stick -- with the exception of a name change. Change the name of syslinux.cfg to something like syslinux.cfg.orig in case things go in a different direction that expected. Tiny files, to be sure, but I can remove them and test the boot to see how necessary they are. I will post my findings as a later edit in this post. This caused Puppy to get confused and ignore my attempts at changing how it started up. But all is now well. Posted: Tue 19 Mar 2013, 07:11 Post subject: Which devx file? which devx file I must load (install) (after full installation) to start the MoManager? I'd love you to be involved, provide advice for a possible future release. If you like it, that's great, but do not hesitate please, we share different points of view. I feel I only listen to myself, as if you have no choice. Express your desires, updates, software, themes, skins, of course the possibility of our comptences and opportunities. -Slacko 5.5 ( I'll ask 01Micko ). -Gslapt, slapt-get, pkgtool, replace petget. ( Apt-get like, Dependencies gestion, less install errors, packages upgrades, command line installer, add more repositories ). If I may be so bold as to make a suggestion. I would like to see a version of Lxpup that carries enough software to fill a CD. Standard applications like LibreOffice, Firefox, Thunderbird and so forth as part of it by default, as well as the ability to boot to more than one Desktop Environment. Allow me to explain why. The standard release of Puppy Linux is small, fast and perfect for older computers as well as to test on newer machines. It works well as a light desktop for basic PC purposes as well as an emergency start up disk to rescue information from a Windows computer that no longer boots up. I'm sure standard Puppy Linux has many many more uses. The standard Puppy Linux helps to save many very old PCs from being thrown away. But there are a growing number of more powerful PCs that could easily run a bigger and fuller version of Puppy. I have no idea if this cross section of computers has a tailor-made release of Puppy for them as well. I know there have been puplets in the past that have tried to put a lot of software together, but many of them are either hard to find or simply disappear. Puppy has succeeded in many areas: rescue old PCs; be very user friendly. So my desire would be to see a beefy Puppy designed to rescue more recent PCs from the trash pile. PHATSlacko has most of your needs. 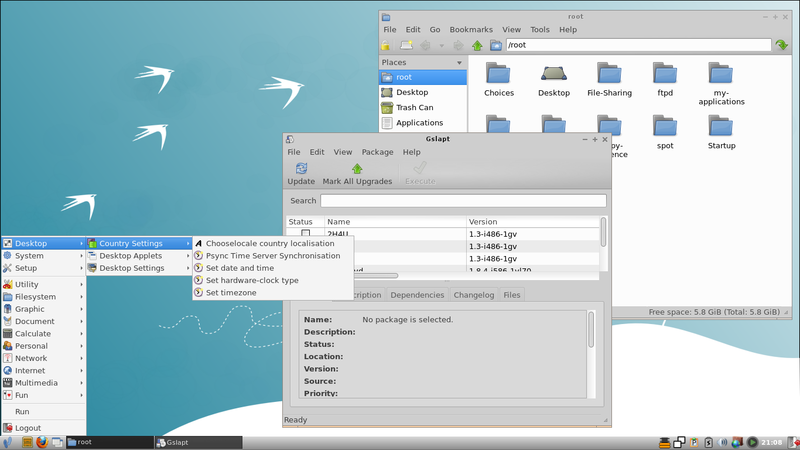 Just needs Jey's LXpup changes for LXDE and other desktops. yes... and it uses an adrive. It would be a good one to base next lxpup -slacko on.. or you can wait .. I intend to build a different puplet, minimal, but with adrive possibility. It will be an ideal puplet building tool. It will have 3.8.4 kernel, lots of drivers, but wont happen until Easter, which is soon. It is still mainly based on slacko-5.5. Thanks for the reference to PHATSlacko. I wanted to say something very quickly here: I do appreciate the whole Puppy Linux project in all its various shapes and sizes. Puppy has gotten me out of more than one difficult situation. So a resounding ''thank you'' for the all who have given so much to make it a leading Linux distribution. The part that caught my eye about Lxpup in particular was its default desktop along with the 4 other choices. And PCManFM gives a new Puppy user the familiarity of the Windows Explorer (no offense to ROX). I will download PHAT for testing. Thanks again for the reference. First thanks you for your tip about the boot, it's really useful. About PHATSlacko, indeed, it contains all you want. Any updates are welcome Jerome. I like the fact that you make a thin Lxpup and a full version. And that they are non-PAE. Too many Puppies are now made as PAE only, which kind of defeats the purpose of a Puppy being able to resurrect old computers. Full version like BobSongs memtioned work great on a newer computer. But I am glad you make the thin version with Abiword, Gnumeric and other smaller applications. Works great on my Pentium M laptop. I saw you were lonely watingto have feedback. I would love to suggest one debian program pyrenamer. ITs an awesome program for us who have alot of files. I would love to see bluefish updated as 2.03 is no were bear what 2.24 does like search directories and replace. I saw song-someone asking about a full version of Puppy. At school that would be awesome. We use old machines. My netbook I have tried to add on programs to lxpup and had trouble remastering - maybe my lack of knowledge. An update libreoffice wold be welcome too. I noticed my 3.62 docs need updating when in 4.01. ( Sorry large pic ). I think no-PAE kernel is important for many users. For the next Lxpup, I create my own repository based with Gslapt, and you'll be able to find Abiword 2.9.4, and Gnumeric 1.12 with all plugins. For packages, don't worry, thanks to Gslapt, I can create a repository with dependencies support, and many packages are available ! LibreOffice 4.0.x is already ready with all Locales if you want ! Once released, I will try to write a Tuto to create your own repository, it's magic ( Really I love it ) . [0x80d9480] [cli] lua interface: Listening on host "*console". 1. This is tested on the CD boot of LxPup 12.12 using the puppy pfix=ram start. 2. This has been tested many times. 3. QT is always installed first. [0x80503f0] main libvlc: Running vlc with the default interface. Use 'cvlc' to use vlc without interface. [0x80d8688] [cli] lua interface: Listening on host "*console". Please note: the two files come from the LxPup website. I'm currently installing software, including VLC, from the Puppy software control panel. I'll post my success with VLC there. VLC installed successfully from the Puppy Package Manager. Yay. It's big and beautiful, weighing in at 673.3 Mb. I opted not to add Blender3D to the party because it runs directly from the unzipped file, no extras or installation needed. The process was a step-by-step thing. There is a location I know of that caters to drop-in people. The men and women who use this service ask to use the computers, offered by the shelter. However, some of the clientele point their browsers to sites that can easily destroy a Windows XP computer that's poorly maintained. Boot time on XP can go as high as 5 minutes. I have since reformatted these PCs, created a custom Puppy distribution to stop the clients from adding endless ''free'' software. However, that was over a year ago. I believe their current Puppy could use an update. FatLxPup is my new alternative. Merci beaucoup for base project. My hope is to bring a more modern desktop to the men and women who probably use Windows 7 computers every chance they get. I have 12.12 installed frugal. How can I upgrade?